Our range of industrial Rubber Lining Pipe and Fittings ( MSRL Pipe and Fitting ) is widely used in various industries. We have in house facilities for sand blasting, rubber mixing, calendering, rubber lining & vulcanizing. 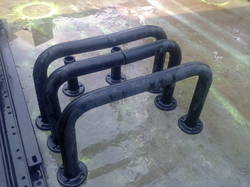 We are manufacturing Rubber Lining Pipe & Fittings equipments as per customer's requirements. The offered range is manufactured using optimum quality raw material that is procured from authentic and certified vendors of the market. Designed with perfection, our offered pipes and fittings are manufactured in adherence with the industry set norms and guidelines. Looking for Anti Corrosive Coating ?